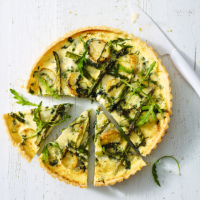 Tender asparagus, creamy new potatoes and peppery rocket – celebrate the best of spring with this delicious tart. 1. Preheat the oven to 180°C, gas mark 4. Roll the pastry on a lightly floured surface to the thickness of a £1 coin. Place a 23cm x 4cm loose-bottomed tart tin on a baking sheet and line with the pastry. Leave the edges overhanging, prick the base and chill for 15 minutes. 2. Line the pastry case with parchment and baking beans or rice. Blind bake for 25 minutes until the edges are golden brown. Remove the baking beans and paper. Cook for 10-15 minutes, until light golden. 3. Meanwhile, boil the potatoes in a large pan of salted boiling water for 5 minutes. Add the asparagus and rocket, then cover and cook for 1 minute. Drain and leave to steam dry for 5 minutes. Add to the pastry case and scatter over the cheese. Whisk the eggs and cream together until smooth, then pour into the tart case. 4. Bake for 35-40 minutes until just set. Cool for 5 minutes, carefully trim the excess pastry using a serrated knife. Serve warm or cold. This recipe was first published in Thu Apr 27 14:53:00 BST 2017.